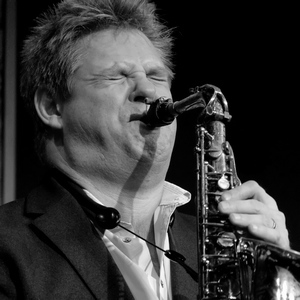 Currenty a member of the Jools Holland Rhythm and Blues Orchestra, Derek was voted one of the top 5 sax players in the country at the 2002 Hamlet British Jazz Awards and has now moved to the forefront of the young British jazz movement. Plus his CD "Young Lions - Old Tigers" recorded with the late Spike Robinson was voted best Jazz CD of 2001 for Jazzizit Records He is the leader of "Sax Appeal", the hugely successful modern Jazz Ensemble which was voted best small group in 2000 Post Office British Jazz Awards The Band has recorded 4 albums, and a Video, toured the world and won a string of awards and rave reviews including the John Dankworth award for Ensemble in the 1998 B.T. Jazz awards. His 1st solo album "Setting New Standards" features mainstream giants Alec Dankworth and Clark Tracey alongside "Incognito" keyboard star Graham Harvey in an acoustic masterpiece. This CD was voted 7th in the Best New CD in the Best New CD category at the 2000 British Jazz Awards. In the mainstream swing world he played for several years with "Young Lions, Old Tigers" alongside U.S.A. sax star Spike Robinson, culminating in their award winning CD. Now he leads "Spike's Young Lions", a tribute to the music of Spike Robinson. He has recently performed in the USA alongside Jazz Legends Dave and Don Grusin, plus Nelson Rangell, Lillian Boutte and George Massau. In the UK he has performed alongside Alan Barnes, Roy Williams, John Barnes, Warren Vache, Martin Drew, Dave Green and many more. In the world of Funk he is a member of "Protect the Beat" alongside Tony Smith (Roy Ayres band), Winston Blissett (Massive Attack/Down to the Bone) and Darby Todd (Drums) having just released their 1st album. He also leads "Atlantik Ave", a classic funk band in the style of Headhunters/Sanborn/Average White Band working alongside guitar maestro Tony Remy.